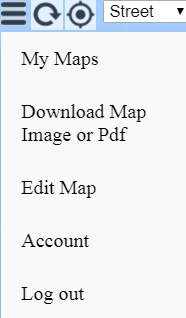 Use EasyMapMaker to export your visible map to a pdf file or an image (not supported on mobile or tablet devices). Create and save a map using either a Pro or Premium Account. View the live map (go to My Maps or click on the generated link) after saving the map. Click on the 3 horizontal lines to reveal a menu. 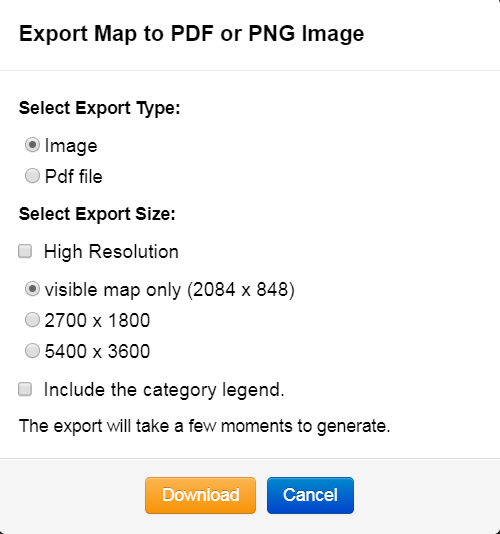 Select "Download Map Image or Pdf"
Choose the approriate options from the modal then click "Download"
PDFs and Images cannot be generated on the create or edit page, only from the live map when you are logged in. The visible map height is limit to 7200 pixels for high resolution and 3600 pixels for regular resolution. The width is limited to 10800 pixels for high resolution and 5400 pixels for regular resolution.